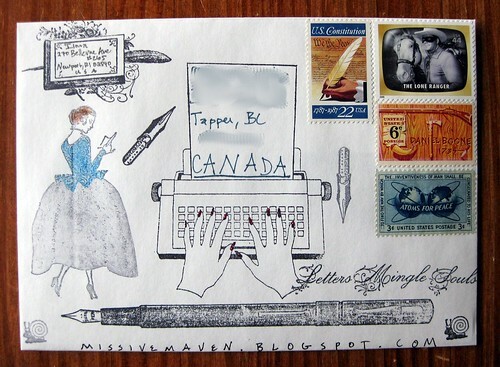 Sometimes it's fun to decorate an envelope with a theme. 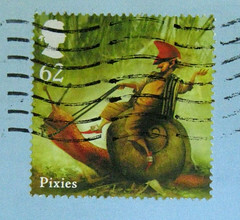 The Anachronism Mail Art Envelope Swap on Swap-Bot seemed right up my alley, and here you see my creation. It seems a lot of my rubber stamps already fit this theme, and of course I tried to use postage stamps to fit the theme, as well. I colored the typing lady's fingernails with red glitter glue for a bit of bling. 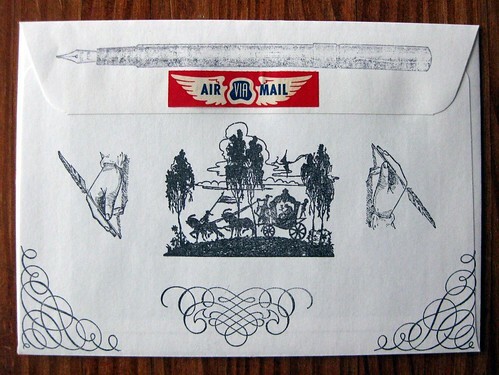 On the back, a vintage air mail label and some more fun stamps. For reasons I can't even explain, I think this carriage scene looks like a fairy tale. It's ironic, this Swap-Bot thing. I really, really spent a lot of time on this envelope, which I thought was pretty fantastic, but the recipient did not give me a heart. I don't expect hearts, but I get them for something as silly as a simple postcard. Hmm. wow this is just foo fah lah and all that jazz lol . god bless honey and have a great holiday . I've only ever done one Swap-bot swap, but I was simply confused by the hearts and didn't give any. I mean, is it something super-duper special you love? Or is it if you send extra goodies? Or is it just that you were happy to receive the mail? Everyone, I'm sure, has a different standard. the glittery nails deserve a heart! i think this is why i'm on the fence about swap-bot just yet...and i think i should put my energy to sending mail to ppl i know, like my aging grandparents halfway around the world, before strangers, right? but sometimes strangers are the only ones who write back! HBD - you're absolutely right, everyone has a different standard for hearts. The official Swap-Bot verbiage is "If someone sends you an extra special swap package that far exceeds the swap requirements, you can give that person a heart." Bklyn, I agree: send mail to your aging grandparents instead of Swap-Bot! I just ordered the "typing lady" alerted to her by one of your readers, who connected with me recently. How much fun this is....to talk about rubber stamps with new "friends." Happy mail day!